There are parts of the mouth when normal tooth brushing cannot get to. These are areas where bone has been lost or where teeth are in usual positions. This creates areas where bacteria can hide from the cleansing actions of saliva and the movement of the tongue and cheek. 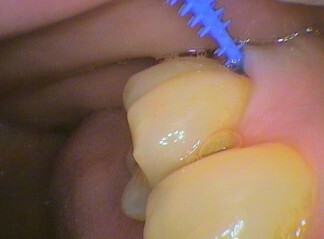 The common areas are bone loss around the roots of back teeth. Spaces between the roots become exposed to the mouth. Bacteria and plaque collect perpetuating the bone loss, and eventually the loss of the tooth. But there is HOPE! Yes the interdental brush. They come in many varieties but basically it’s a little brush that negotiates concavities and spaces. 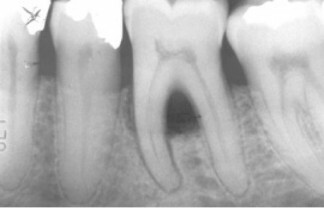 The xray shows the bone loss on a lower molar with two roots. Effectively a tunnel has been created in the bone. This means with the loss of bone more of the tooth needs to be cleaned! 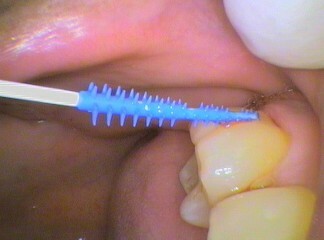 The pictures with the blue tip spiky tapered Caredent interdental brush shows how to negotiate such a situation. Place the brush on the outer surface of the tooth and use the tooth shape to slide the brush into the space between the roots without pushing the gum around. The bacteria lie on the surface of the tooth so by applying the brush carefully to the tooth surface and then follow it to enter the space in the bone. The aim is to press firmly on the tooth surface, once the brush cannot go any further, and DRAG the sticky plaque and bacteria out of the space along the tooth surface. It’s TIME OF CONTACT that ensures thorough cleaning. To really give the cleaning more “KICK”, dip the tip in an oral antiseptic like Listerine or Savacol. The antiseptic in the small space will sit there for quite a while at a higher concentration than any mouth wash. It’s a targeted use of an antiseptic. Remember there are two sides to a tooth and the other side of the tooth needs to be cleaned. It’s best to clean these areas before using a tooth brush or tooth paste otherwise the paste may make difficult for the brush to enter the space. Try and clean theses areas at least once a day so tartar does not have a chance to build up and block the entrances. 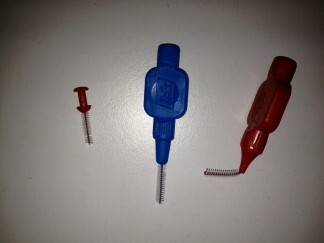 For larger spaces between teeth there are interdental brushes that look like a bottle brushes. A particular brand shown are called tepe brushes They can be bent and come in various sizes. Upper molar teeth roots are more difficult as there are usually three roots to negotiate. This is best shown by the dentist how to negotiate the tooth, as it depends where the bone loss has occurred. This is, unfortunately, a life time commitment for the tooth. How long its life is, IS UP TO YOU DAILY. At Seymourdental for some patients we help them by cleaning these areas every three months with special instruments and the ultrasonic cleaners. For some people a referral to a gum specialist known as a periodontist may be necessary.